For over 50 years, Mitsubishi has remained at the forefront of the mini split industry thanks to their dedication to providing efficient, user-friendly comfort solutions. Part of Mitsubishi's hyper-heating product line, the MZ-FH09NA is a packaged single zone heat pump mini split system designed to bring high-efficiency zoned comfort to homes in frigid climates. The wall mounted indoor unit, boasts a functional design, and operates at volumes as low as 20 dB. Thanks to the included mounting plate, it is easy to install on nearly any wall. 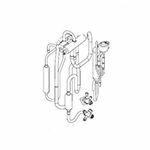 The outdoor condenser uses some of the most advanced technology available to modulate temperature without the energy-wasting overshoots and short-cycling associated with simpler systems. With an included wireless remote controller, this system is the perfect combination of convenience and comfort for any application in a sub-freezing environment. The MZ-FH09NA is equipped with inverter technology and an electronic linear expansion valve. By adjusting compressor speed and refrigerant flow, the output of the unit can be matched to the zone for precise temperature control and improved efficiency. The MZ-FH09NA i-see Sensor 3D monitors the floor and ceiling of its zone for fluctuations in temperature. If it detects an underserved area, the MUZ-FH09NA will temporarily adjust airflow to ensure complete comfort throughout the zone. This sensor also serves as an occupancy detector, allowing the indoor unit to enter energy saving mode if no human heat signatures are detected within the zone. Low or negative ambient temperatures don't bother the MZ-FH09NA. It is rated for 100% heating capacity at 5 degrees F and continues to provide heating in outdoor conditions as low as -13 degrees F.
With three unique filters inside the MZ-FH09NA, the air in your zone is not only being conditioned, but it is also actively being cleaned. A catalyst-coated filter serves as the first level of defense against odors. It is backed up by a second deodorizing filter that utilizes a ceramic surface element and platinum nanoparticles to absorb any offending smells. The final filter is an enzyme-based anti-allergy filter that captures and destroys bacteria and particulates.